Despite initially claiming Hamas not part of unity govt., White House now glows over Gaza meeting with Hamas. The Hamas terrorist group was present as the Palestinian Authority (PA) unity government held its first full cabinet meeting on Thursday in Gaza, and according to the White House it was a "positive step." 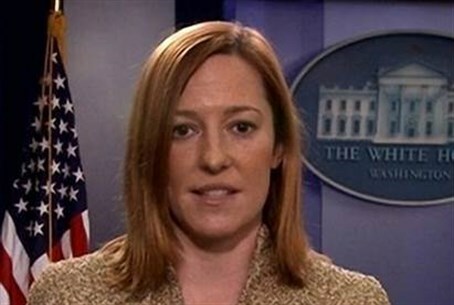 "The only way to have a long-term sustainable solution for Gaza is for the Palestinian Authority to assume full authority in Gaza," US State Department spokesperson Jen Psaki said Thursday. "So we support this interim technocratic government in its efforts and we view this meeting as a positive step in that direction." Judging by the response, apparently the PA was successful in its move to hold the meeting in Gaza so as to convince world donors ahead of the October 12 donor meeting in Cairo that it, and not Hamas, is in charge of Gaza, thereby trying to placate fears the money will go to terrorist uses. PA foreign minister Riyad al-Malki directly stated that this was the goal of the meeting. The American administration has already pledged roughly $118 million to rebuild Gaza after Hamas's latest terror war on Israel, with Psaki on Wednesday saying "we do think that Israel will need to play a role in the Gaza reconstruction." America has previously claimed Hamas is not represented in the unity government to justify its supportive stance on that government - despite the fact that one of the unity government ministers was previously the education minister in Hamas's Gaza government. However, following the meeting Thursday that Psaki termed a "positive step," Hamas leader Ismail Haniyeh and unity government Prime Minister Rami Hamdallah vowed in a press conference that they will press for elections after the reconstruction of Gaza. Those elections will almost certainly see more Hamas members brought into the government given the swelling of support for the terror group in polls since Operation Protective Edge, making the White House support further questionable. Likewise, Haniyeh said in the conference "the division in the Palestinian people has ended. We have one government and one region," a claim that similarly makes the initial US justification that Hamas is separate from the unity government irrelevant. The PA unity government has already demanded the staggering sum of $4 billion from the world to rebuild, aside from $4.5 billion to save itself from its massive debt. Many fear the money will once again be funneled for terrorism and to pad the pockets of officials, particularly after a Fatah spokesperson recently accused Hamas of stealing $700 million in international funds.